Yesterday, right after I wrote about my love affair with paper, I went into the Processing Office to see what I could find. The processing office has lots of great things in it. Book pockets, a fax machine (with paper in it), people's In-Boxes (usually with papers), book stickers, labels, label-covers, pens, pencils, comfy chairs, shelves, and a nook for me to hide in when someone's after me. And lots of other neat things. For some reason, the Staff keeps this Office shut at night. I am told that I will probably get in Big Trouble if it is left open. I saw this nice paper with labels on it, so I took a nip or two. Just little ones. This label attacked my Whiskers! I could see it out of the corner of my eye, and I could feel it, but I could not fight it off! I ran, thinking I could outrun it! Didn't work. 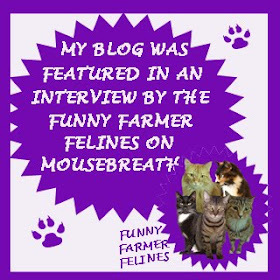 I ran some more, and it was still on my Whiskers! Then a Staff member started chasing me, so I ran some more! This went on for a while, until I was All Tuckered Out, and I didn't care anymore if I had to go through life with a stupid label stuck to my Perfect Whiskers. One of my Staff people scooped me up, and Linda carefully picked the label off. She did a Very Nice Job, and I only lost one Whisker in the process. I think I might keep out of the Processing Office for a bit. If you click and make the picture Big, you will see that it was a "Thorntown Public Library" label. This is what the Staff puts on things that belong to my Library. The Staff thought that the sticker meant that I belong to the Thorntown Library. I do not belong to my Library. My Library belongs to me. 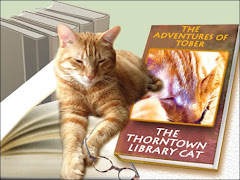 I am just very generous to share my soft places and Staff with Thorntown Library customers. Oh, I share books and other things, too. Things I like to play with. You may remember that I like to chew on Cords. I like chewing on them so much that I broke my New Year's Resolution by destroying Assistant Boss Karen's monitor cable. . . although I did it in stages, so I should get a little credit. I've discovered that there are many other things that are fun to chew in a Library. Here are some of my Favorites. Von's Ape Bookmark has a very nice and foamy consistency. It is nice to hold in my teeth, and I can chew little bits off and leave them in the floor. This irritates Von, because I guess she likes her Ape Bookmark. However, as Boss of Thorntown Public Library, the fact that I like to eat it overrides the fact that she likes to look at it. Besides, have you noticed the shifty eyes on that thing? Christine's Jade Plant has nice, thick, juicy leaves. Eating the Jade Plant is a bit of an adventure, because Christine seems to think that she can hide it from me. No matter where she puts it, I will track it down and chew a previously unblemished leaf. It is nice to have a change of Scenery with each dining experience. Paper comes in many wonderful sizes and textures, and all are equally fun to chew on. The curlicues of paper that postage stamps come on is one of my favorite varieties, and I am training the Staff to save these for me after Newsletter Day. I'm also fond of anything Important that Karen happens to be working on. This means that I have a continuous supply of Important Documents and Emails to snack on. I've recently discovered that Receipts from the new receipt printers crinkle very nicely in my masculine front paws and strong, sharp teeth. My vicious paper-tearing should impress everyone, considering that I do not have Fingernails to assist in the destruction. I have to use my hands when I drop the Gourd because there isn't a nice sturdy stem to grab with my teeth. Gourds are also much lighter than little apples, so sometimes I get a good Slap-shot in and fling them across the room. In this picture I am working very hard to hide my irritation with my Assistant Assistant Boss. It's tough being a Celebrity. On Saturday I learned that I do have a limit when it comes to treats. Unfortunately I learned a little too late. I would have pictures, but my photographer was not available, and you wouldn't want to see them anyways. Today I got mostly tummy rubbings and a little Catnip. I feel all better now. I think I'll take it easy on the treats for a while. Oh, and on further consideration (and attendance) I've decided that Staff Meetings are fabulous! No matter how "Important" the meeting is, my tummy is First Thing on the Agenda! Most of you probably remember the horrible Accident that I had a few months ago in which I lost my precious Toenails. My left foot got infected and was stinky, but Dr. Jon at the Thorntown Veterinary Clinic gave me Medicine and said that I would get All New Toenails someday. Well, I'm here to inform you that they're here! The new ones aren't very impressive just yet, but I have nubby little Toenails on my left foot! One of my Assistant Assistant Bosses discovered them this week, Upside-Downed me, and announced my Big News to the Staff. I was hoping she would wait until they were full-sized and Razor sharp, but it doesn't take much to get the People excited around here, and I like to let them have their fun. It is part of my Management Style. For those of you who don't know, Upside-Downing is this horrible thing that some Staff members like to do to me. They scoop me up (usually from a Nap, when I'm all Soggy and warm) like a Human baby and carry me around with my Feet in the air. It's a bit humiliating, by my Tummy does get rubbed quite a lot when they do it to me. This has been a Very Busy Week. I was beginning to feel Neglected, because everyone was so excited about the new Plastic-Scented Evergreen Library Cards that they almost forgot to give me Dinner a few times. Lately I have been waking from my Nap, going to where my dinner should be, scowling at the crusty bit of breakfast left in the bowl, and yelling at the nearest Staff person. Then they go "Oh, Tober, you need dinner!" like it's a big surprise or something! On the flip side, I did learn something very valuable this week. On Tuesday, Wednesday and Thursday, when the Library is open until 8:00, the Staff still feeds me at 5:45, so I don't get Upset by a weird change in my schedule. Well, if I eat my Dinner really fast when Assistant Boss Karen isn't looking, there is a chance that she will feed me again, thinking that I missed Dinner!!!! The Library Staff has been very generous with the Treats and the Catnip this week. When they get Stressed Out from all of their Very Hard Work, they talk to me and I make them Happy again. Lucky for me, the Giving of Catnip seems to make them Happy, especially Bonnie, who always caters to my need for a nice roll in the floor. 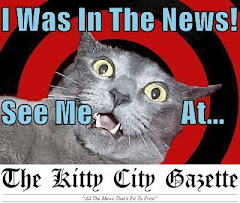 If you click and make this picture Big, you will see that I have many, many pieces of Catnip stuck to my fur. I also had my picture taken while I was lounging near the water fountain one night. I do not usually let people take a lot of pictures of me (especially with the flash on), but I was reminded that many of my Adoring Fans can't make it to the Library to see me in Person. I wouldn't want them to suffer because they live lots of miles away! I will try to be better about picture-taking in the future--unless I am cleaning myself at the moment. 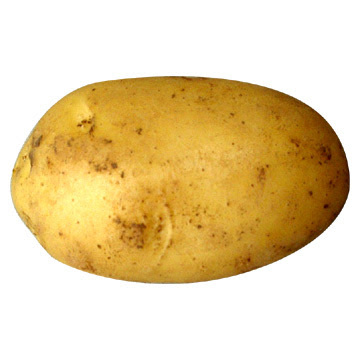 These pictures really capture my Irresistability. Here I look like I am waving. "Goodbye, Photographer, I am trying to Sleep!" Now I have Updated you on my Week. I will try to write more often, but it is very hard for me to get on the Computers here, since the Staff is hogging them all. I think I need to remind them of the Importance of my Job. As you can see, there is absolutely no resemblance. Now, I do realize that there is an "Add to Dictionary" button in the little Spellchecker box. The point is that I should already be in the Dictionary. I wouldn't even have minded if the Evil Spellchecker tried to call me October, since my Finding Day is in October, for which I was named. 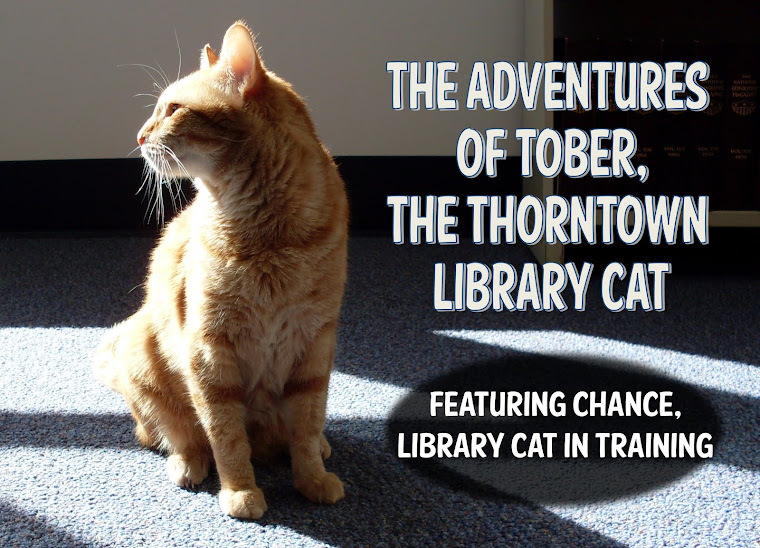 I have previously addressed this issue in my Blog, The Adventures of Tober, the Thorntown Library Cat, which should be required reading for your Organization. I am a Very Good Library Boss, and you can learn a lot about how to manage your Staff and get them to love you at the same time. I'm sure Mr. Gates will direct you to read about me, since he has been such a Big Library Helper. I am considering writing a letter to the Oxford English Dictionary People as well, since they will want to include me in the next edition. Let's hope this does the trick. The Evergreen cards are here! Hooray! Hi everyone! This is a Very Special Blog Post to let all of my Wonderful Customers know that the Evergreen Indiana cards have arrived at the Thorntown Public Library. I have inspected them, and found them to be quite Green. I had requested Catnip-scented (to go with the Green), but apparently this holds no appeal for most Library customers. These smell like plastic. The Evergreen Cards will give our Thorntown Public Library customers the Super-Powers to visit places like Lebanon and Zionsville to check things out! To see a list of Libraries participating in Evergreen Indiana, visit my Library's website. PS--My Staff is Excited about these new cards, too. Which I think is a little strange, since they see Library cards every day. I am very, very Sorry that I haven't had time to post in the last week. It has been very busy at the Library, and the Staff has worked hard to prepare for the new Library system. They all did Training so that they can be Very Good Library Staff when we open at 2:00 on Monday. They have asked me to relay a message to our Wonderful Customers: "Thank you for being very patient with us and for making the effort to return most of your items by this week-end. This will make the transition easier for all of us, and we can't wait to see you again when we have our new Evergreen system up and running!" Or something like that. Monday they had a Staff Meeting which I attended. I have learned that I should be present for Staff Meetings, because when I roll over in the center of the table, anyone within reach is unable to resist my remarkably soft belly-fur. They worked hard with this Evergreen thing. . . so hard, that at first I thought the attentions to ME were going to decline. This was not the case. I got Catnip every day. I usually don't get Catnip every day, but I think they felt Guilty because they were focused on Other Things. I am also learning that the library has many wonderful Sleeping Places. It has been warm here, and there are lots of things to watch out the windows as Spring comes. (I guess Hoodie-Hoo Day works, so I must be on the lookout for other Human Super-Powers.) I find that it is very Peaceful to take afternoon naps in the Adult Stacks. Notice how very Serious my Assistant Boss Karen is in this photo. She and Cathie, Linda, and Christine were all very dedicated to the Hunt of the thing. My Staff makes an excellent Team when called into action. If the thing is still in the Library next week, we will undoubtably find it and give it a stern talking to. If I don't eat it first. The highlight of the week was on Saturday when I was visited by a Celebrity. 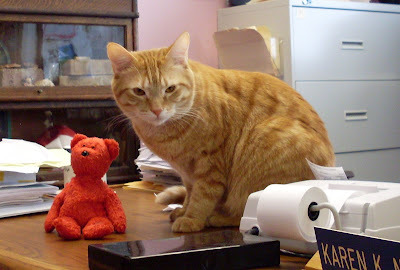 Big Red, a renowned Beanie Baby Bear, was driven to the Library by his Personal Assistant Judy Cox. Big Red is a World Traveler, and I was Most Excited to meet him. He is small in size but very big in Personality and Charm (kind of like me!). We had a photo session--with TWO photographers--which in my opinion is Very Big Doings. I even signed Big Red's autograph book and gave him the link to this blog in case he wants to keep in touch. I think I should have an autograph book, too, so I can keep track of all of the Very Important People I meet! As you can see, it was a very fun-filled week!